If you would like to learn what our patients experience when they visit Dr. Brian J. Waggle in Zanesville, Ohio, feel free to browse our reviews. It is easy to see why our patients are loyal to our dentist. We work hard to ensure that you and your family receive excellent dental care when you visit our office. To learn more and to schedule your next visit, contact Northpointe Dental today. Always a pleasure, keep doing what you do 🙂 – Jennifer W.
entire staff are great! Keep up the GREAT job. – John O.
repaired. 🙂 – Lori R.
less than the best! – Martin K.
be helped. Thank you! – Cynthia K.
as usual. – Joshua H.
feel comfortable. – Pattie A. Everyone at Northpointe is wonderful! – Albert M.
it simple. – Kanon K.
of their game. – Mary D.
Tiffany the hygienist was wonderful. girls work together as a team which is nice to see in today’s world. -Barb L.
Apr 4, 2018 5:02 PM All staff are always courteous & respectful. – Wanena E.
teeth as she does every time. – Erine W.
Excellent staff as usual. – William B.
questions we may have. – Linda B.
. Dr. Waggle, takes his time with you. All staff very nice . – Marianne M.
The visit was exceptional as usual. -Connie M.
her name, but she was nice and did a really good job! – Dianne J. Good visit!!! – Patrick F.
always has a nice smile.Very nice office staff. – Vickie H.
greeting to walking out the door. – Jennifer M.
always a pleasure to see . – Debbie A. Very pleased! – Jodi H.
Everyone was very friendly and accommodating. – Maggie C.
My visits are always very pleasant. Your office is always so helpful…and goes above call duty. — Annette B. Your office is always so helpful…an goes above call duty.. I was so happy they called me with an appt. time for earlier time that fit my schedule even better. Great visit as always — Jeremy D.
Alisa Copeland — Alisa C.
As always- everyone is so pleasant to work with! I’m always glad to see all your smiling faces!! I hope you all have a Happy and Blessed Easter! — Kathleen K.
The entire staff made my visit a pleasant experience. — Joseph K.
Far more than just your local dentist. Dr — Melissa P.
Far more than just your local dentist. Dr. Waggle and his staff go the extra mile on so many different levels. Brooke at the front desk is always cheerful and in a good mood — James M.
Brooke at the front desk is always cheerful and in a good mood. My hygienist, Danielle, was very personable and professional. Overall a very good experience. Great staff and experience — Angela H.
Everyone is always so nice. You can tell they really care about your oral health. I always feel like I am visiting family when I come to the office, you guys are the best. — Rita B.
I always feel like I am visiting family when I come to the office, you guys are the best. Very professional and considerate. — Linda K.
Excellent care — Erika B. Everyone is always friendly and professional. Dental rooms are very clean and comfortable. — Loren T.
Everyone is always friendly and professional. Dental rooms are very clean and comfortable. Yes, I had a great experience getting my teeth cleaned — Vicki H.
Yes, I had a great experience getting my teeth cleaned. Katie was so caring and very understanding of my shoulder issues , she even got me a soft blanket to place under it. Always enjoy talking to Dr. Waggle, he always has a great smile. All I can say is the office staff must really like their jobs , because everyone looks so happy. 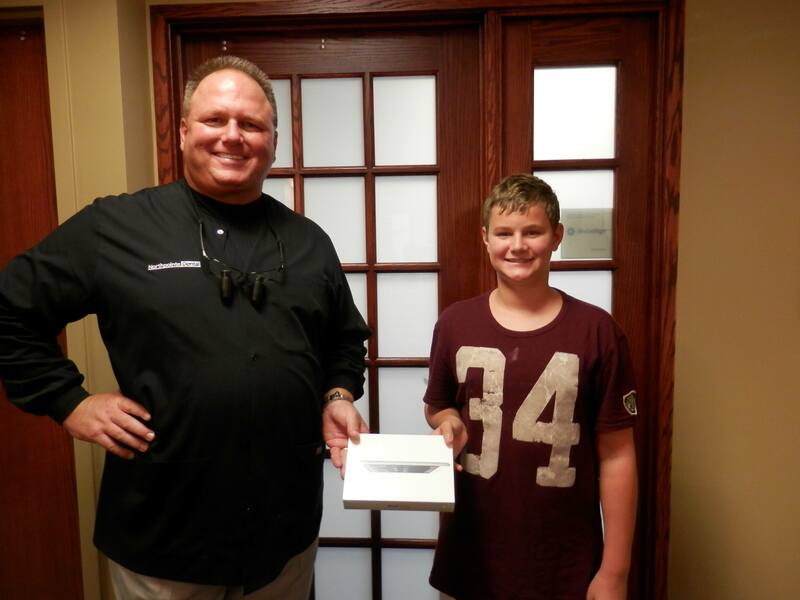 Congratulations Gage on your FREE IPad Mini. Call today for details on how to get yours. I hope you know, all joking aside, we are glad you have this chance to spend so much uninterrupted fun time with your beautiful family. Personally, I’m just really jealous! Our teeth are fine because of you but miss the security of knowing you are here if we need you. Just remember, your patients believe that no one can fill your shoes—or our teeth, for that matter—as well as you. Please enjoy the balance of your water-therapy-in-the-sun recuperation! Dr. Waggle– Thanks Carol. I am blessed to have this special time with my family, even under the circumstances. Having great patients like yourself make me know that what we do matters. Treating our patients like family is a goal we strive for everyday. Looking forward to getting back to work on July 1, 2013. Dr. Waggle– Thanks for the compliment. It’s easy to look good when you have a great staff supporting you. As always, a great visit! staff does a great job. Dr. Waggle– Thanks, we have a great team. As always, the staff and Dr. Waggle are wonderful. Thank you for the Mothers Day flower. Dr. Waggle– Enjoy all the blooms throughout the summer. Everything was great! We are so happy to be back with Dr. Waggle and his staff!! We will gladly recommend you to our family and friends! Dr. Waggle– Glad to have you back. Dr.Waggle’s assistant was excellent. I want her each time. I realize the length of time was necessary, but two and a half hours is a long time to lay in one position. Thank you for the dental care. Dr. Waggle– Great results take time and finesse. Please ask us for more breaks, because we all can use a break. Jack Daniels in the goody bag. LOL. Just Kidding. I would recommend Dr. Waggle and his staff to anyone. Dr. Waggle– Thanks Connie. We appreciate the compliment and enjoy having you as a patient. No changes necessary. You all do a great job! Dr. Waggle– Thanks a bunch! New girl. Someone should have been working with her to make everyone feel more comfortable. Cleaning was great but her unfamiliarity to the office was evident. Dr. Waggle– I appreciate your comment. We are sorry that the appointment didn’t flow as well as you as accustomed to. However, since then, this team member has worked very hard at making patients and her fellow team members feel comfortable and secure. When I walked in, they greeted me with a warm smile and called me by name. The massage chairs in the rooms are WOW!! Love the salt water fish tank in the reception area, my son was totally fascinated by all the different sea creatures. The staff was so great with my son, it was his first visit and he loved it. Dr. Waggle made us feel like family. I am actually looking forward to going back for my next appointment. I never thought I would say that about going to the dentist.